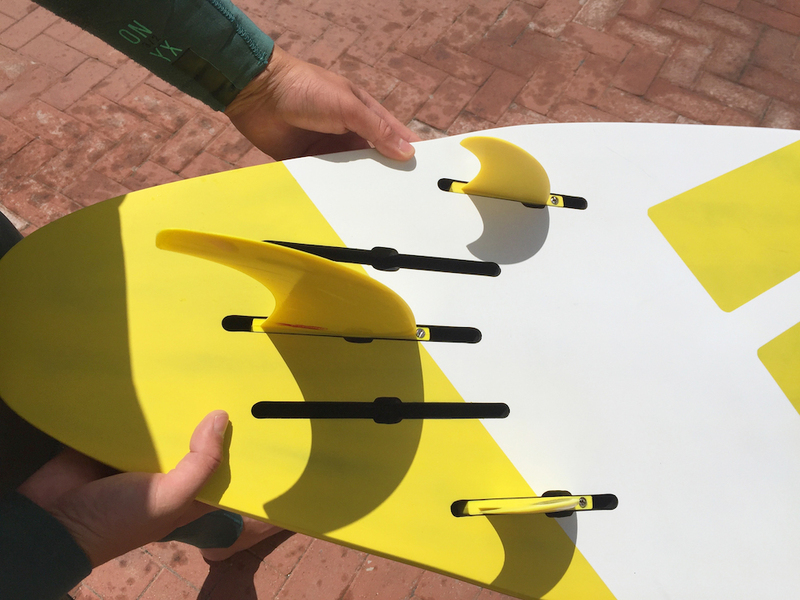 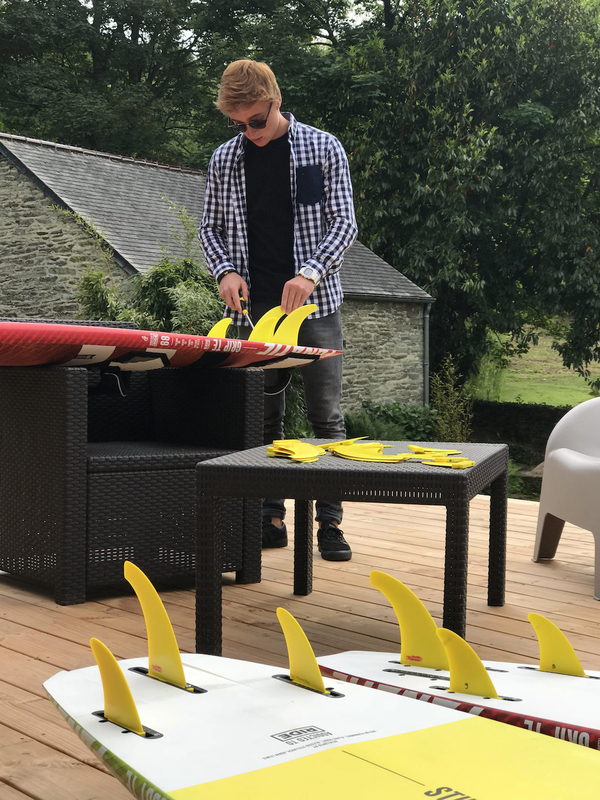 Before the Pozo event we asked all our team rides how they set up their wave-boards, we hope you find the tuning insights useful! 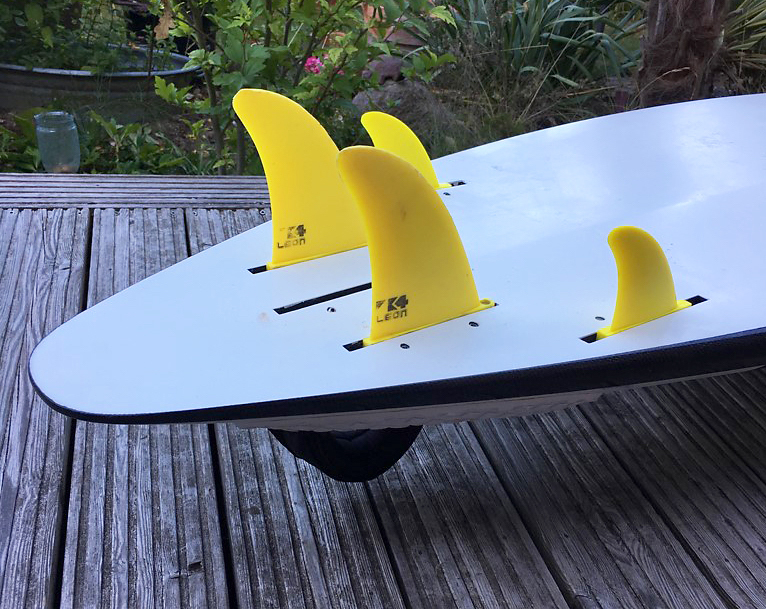 Note: All of the rears shown are now available to buy in the shops/online. 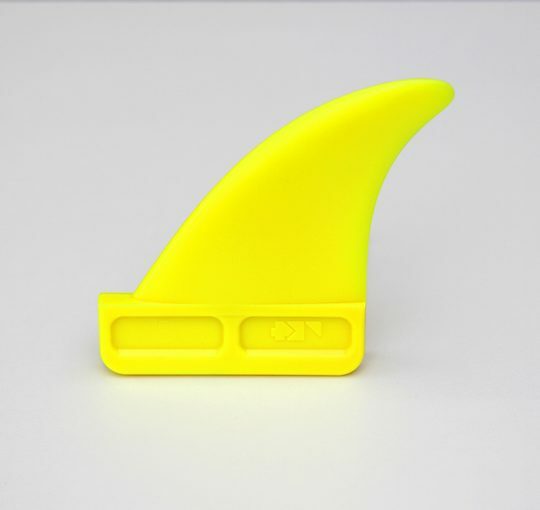 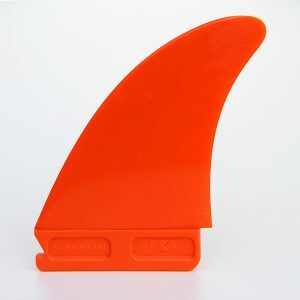 The fronts we’ve been doing a lot of R&D work recently so some of the fronts shown will actually be SharkII’s with 30/70 or ‘Ezzy foils’ and various toe angles, which are moulded plastic, but aren’t available until we decide which to put into production. 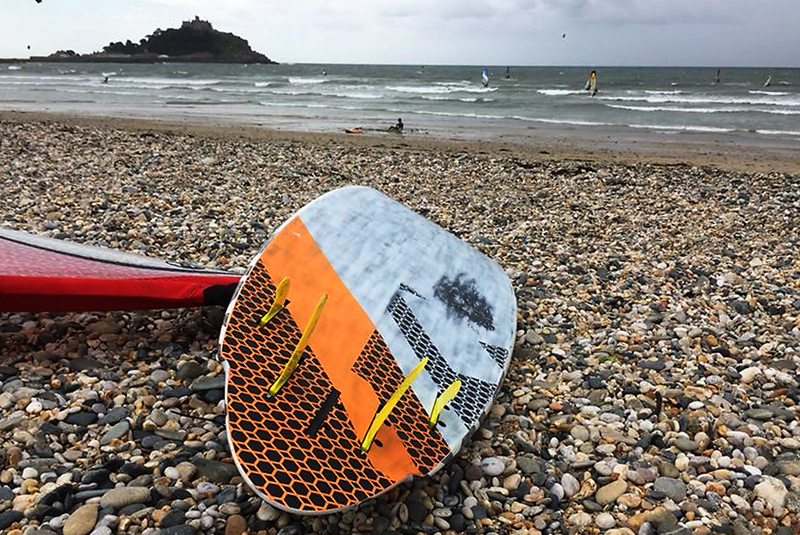 Huge thanks to all our riders for their input! 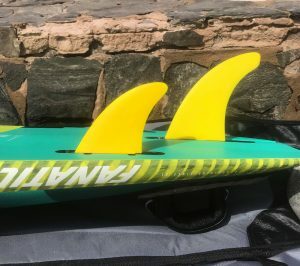 Simmerstyle Quantum 115, 17cm Flex and 10cm SharkII. 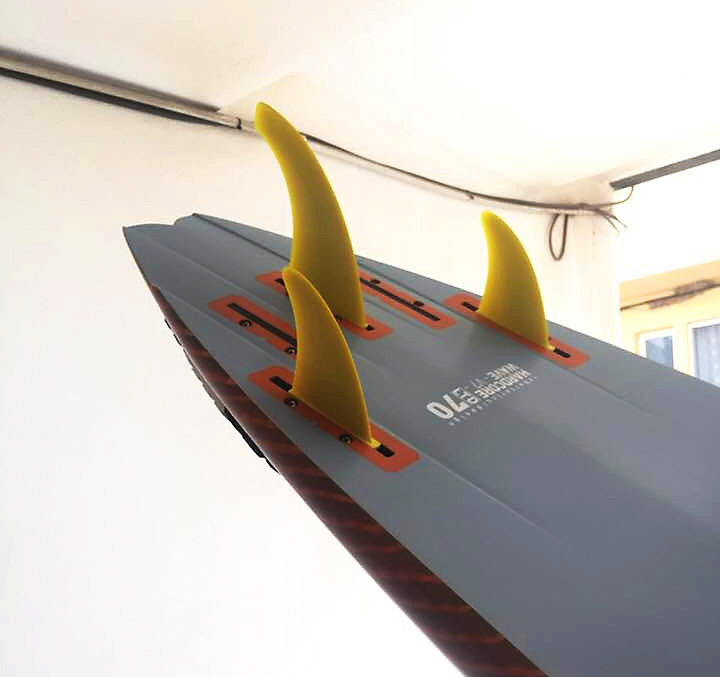 Simmerstyle Quantum 105, 16cm Flex and 9cm SharkII. 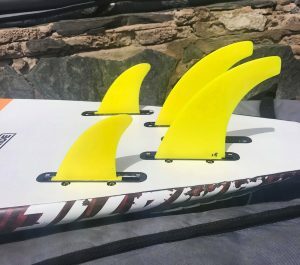 Simmerstyle Quantum 95, 16cm Flex and 8cm SharkII. In small waves below waist-hight I move the rear fins 2mm forward. 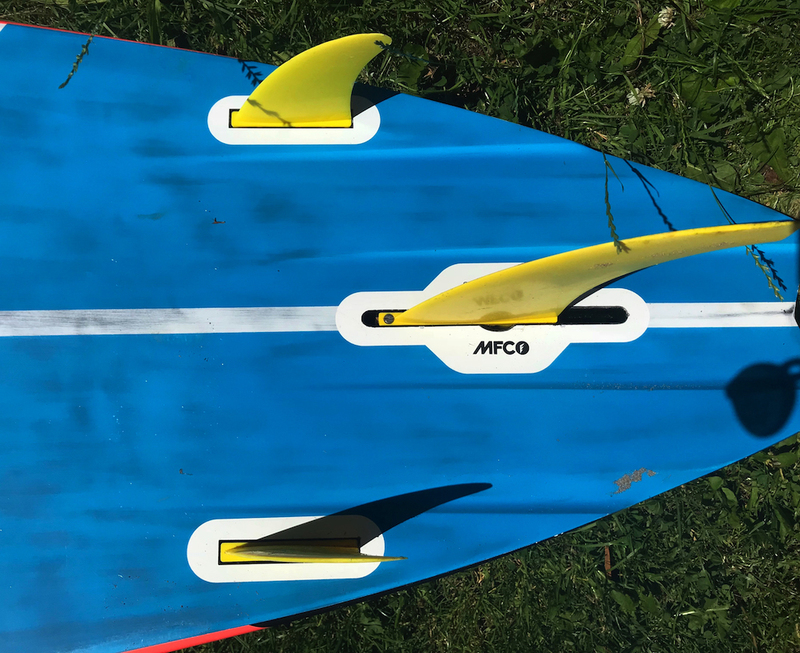 In bigger waves above head-high I move the rear fins 2-4mm backwards. 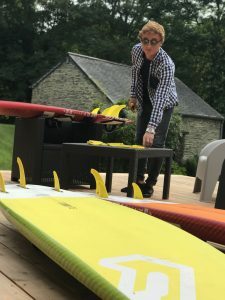 “On my grip 76 I’ve got 5 boxes. I use 2 shark 10 and a flex 15 as center fin. 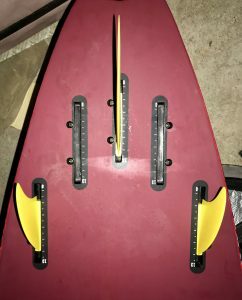 I choose this set up because it’s looser than the quad setup and more playfull in small surf. 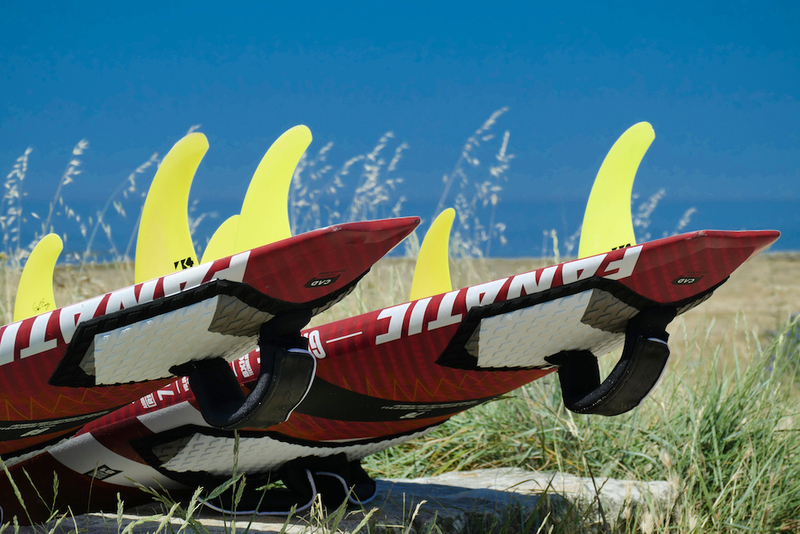 It’s fast enough to jump but the rather small center fin is not the best for quick planning. When it gets bigger I use 2º ezzy 10, 1º instead of the sharks. 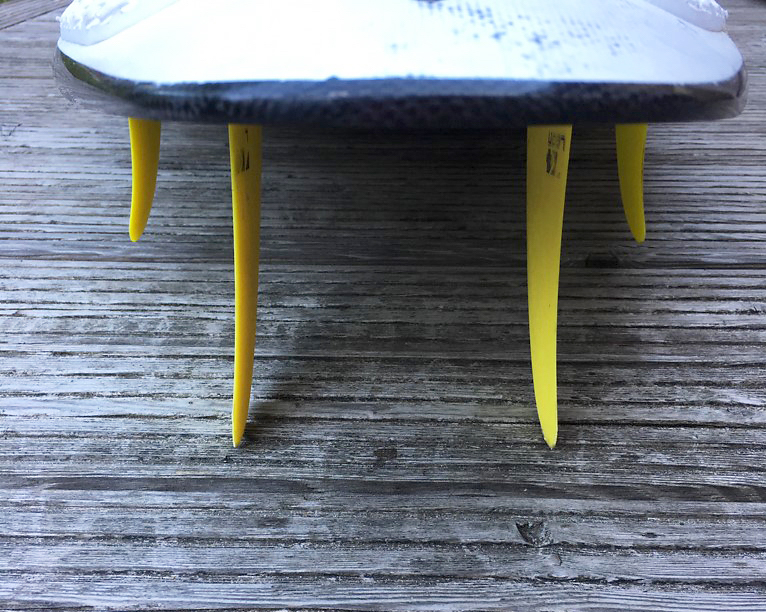 It has more grip, carves easier, but it’s harder to release the tail for takas for example. 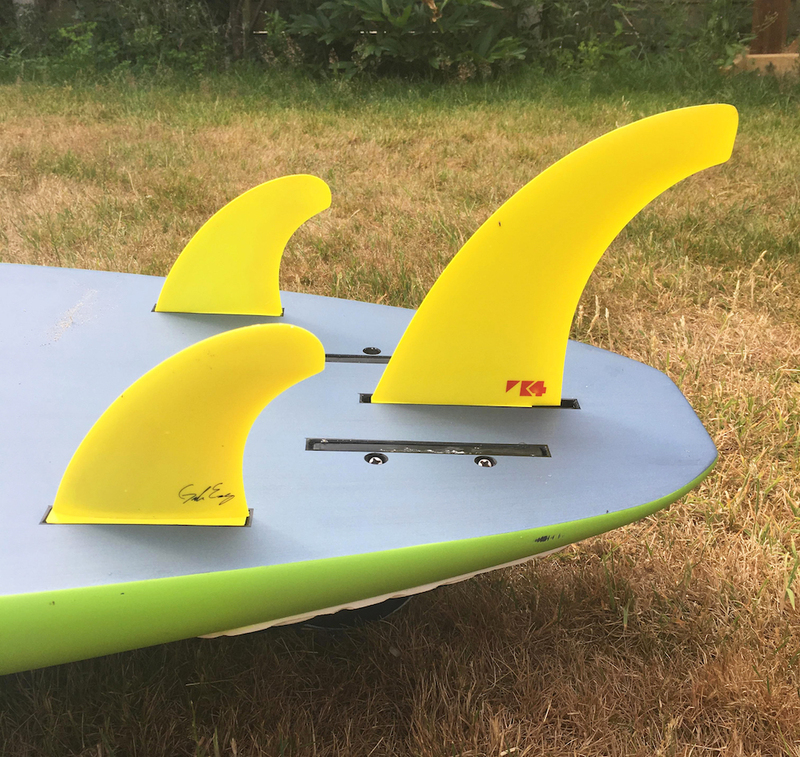 The short center fin (I think 15 is quite short ?) 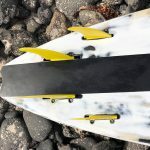 still allows quick rail to rail transition. 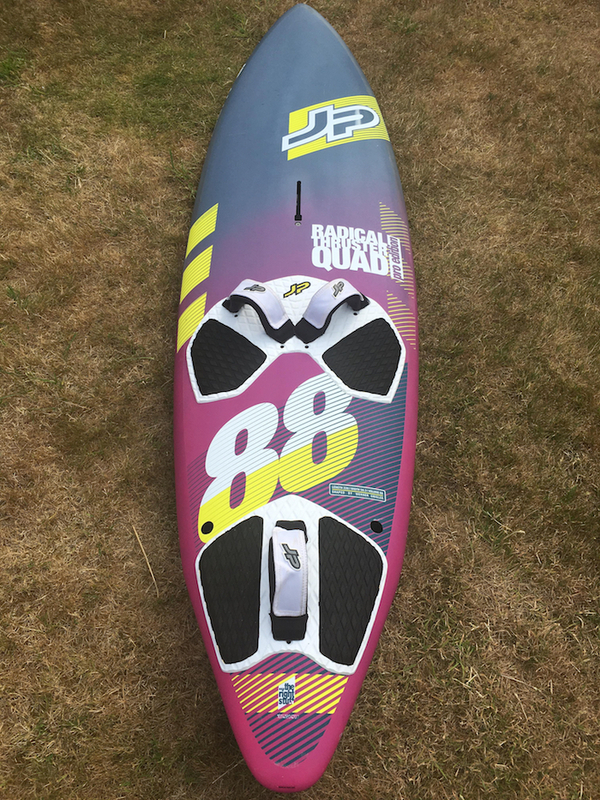 My Grip 68 is a quad. 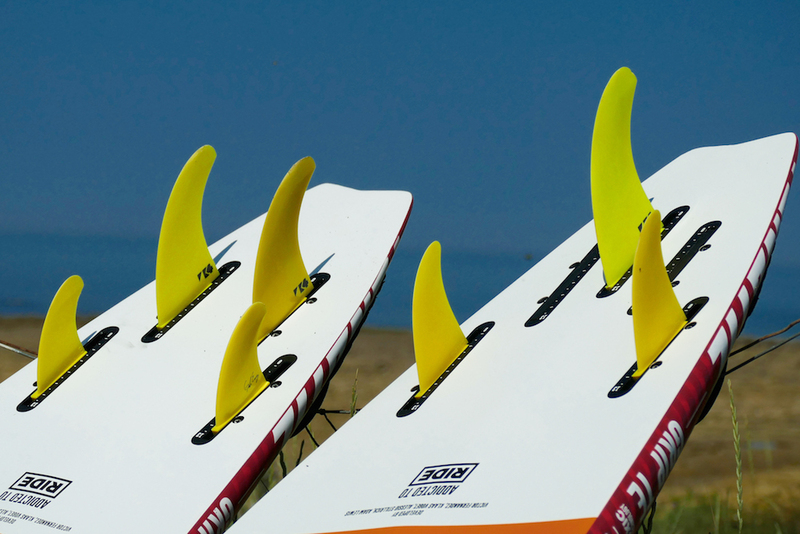 Ezzy 1° 8 plus flex 13 is the most versatile setup for me : low drag for speed and good projection out of turns. 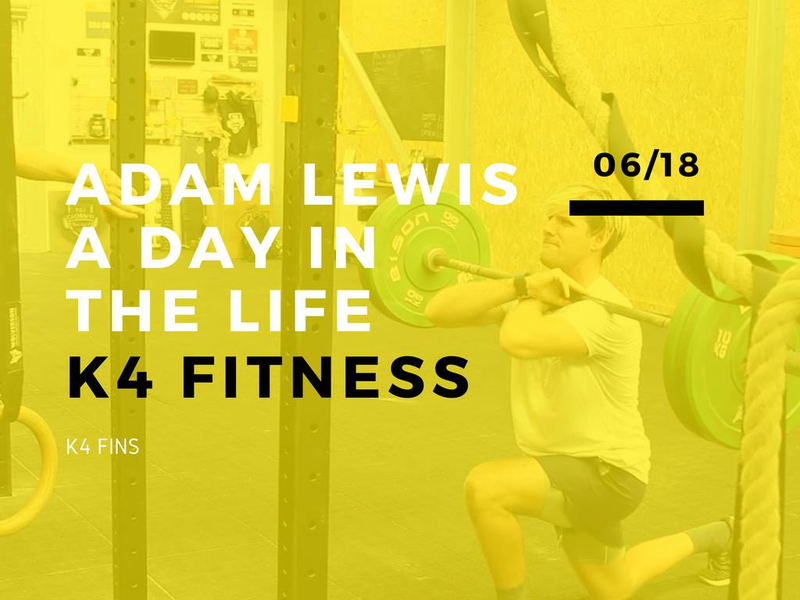 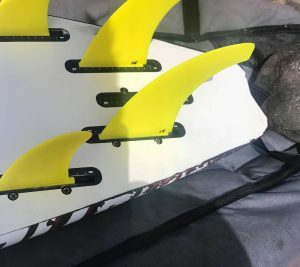 “In the quad I have straight fin boxes. 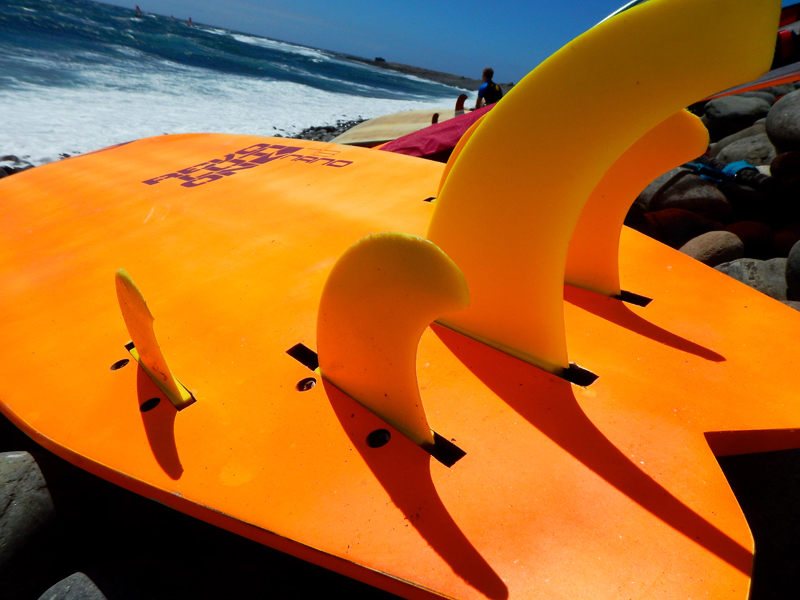 I use all Ezzy Asymmetric 2º. In small waves 10+12. 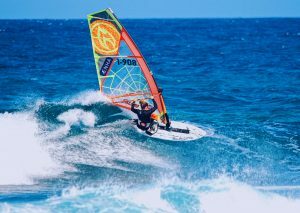 In medium/big waves 12+13. 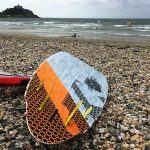 In this way I feel there is nothing holding back the board and it feels very loose. “At the moment I am using an 18 Scorcher with a pair of 10cm SharkII . 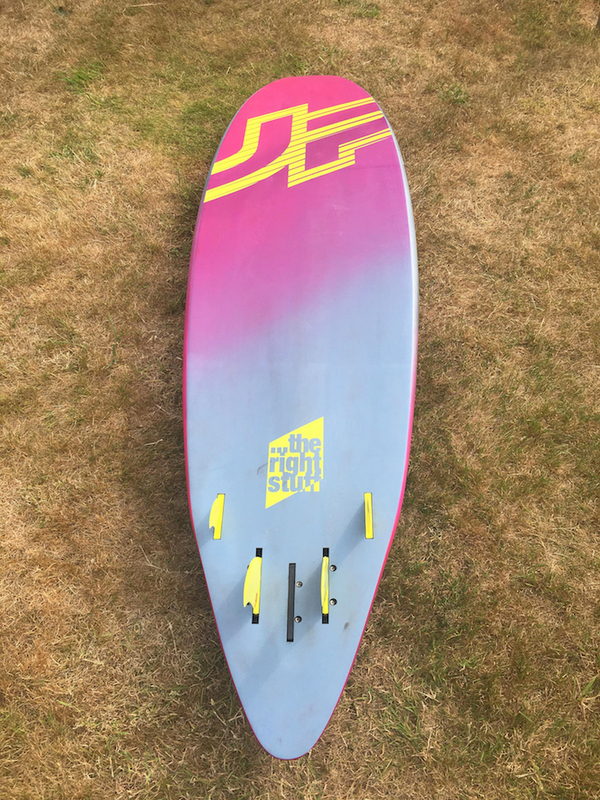 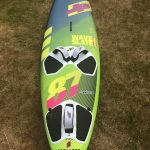 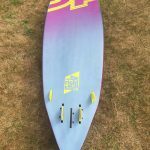 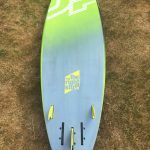 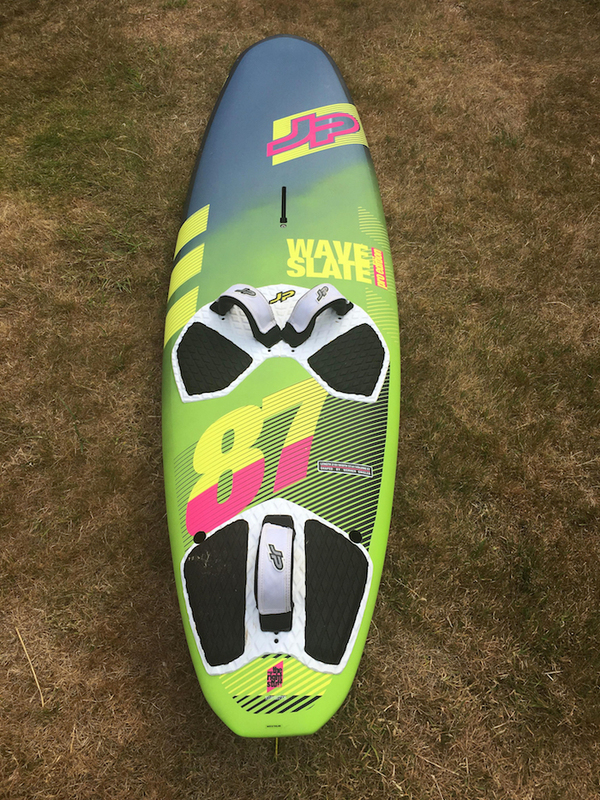 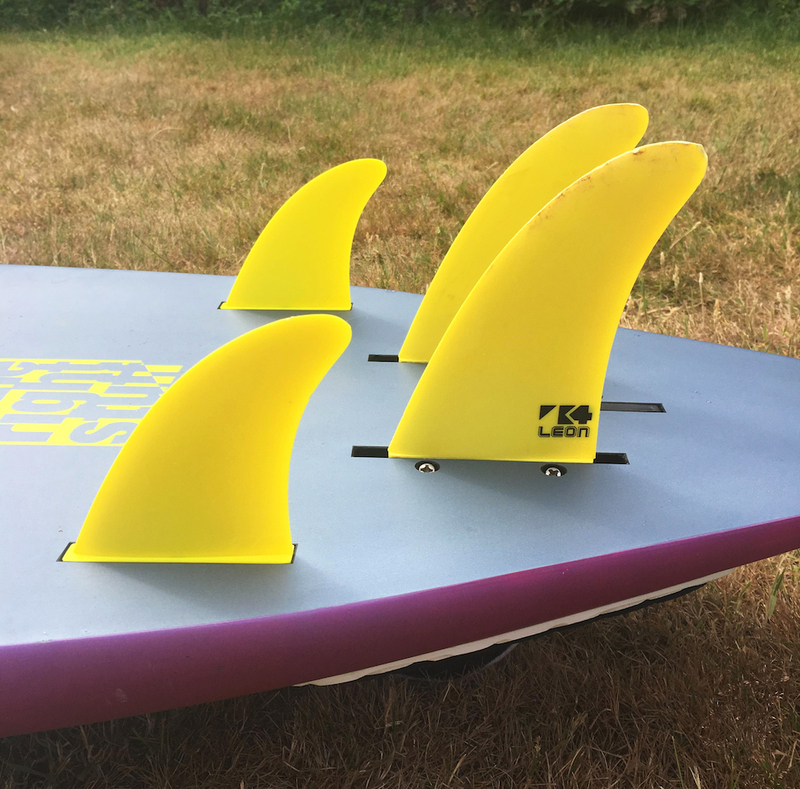 The past few months I have actually been using a 17 Scorcher in the 88ltr board, the reason I changed this was because I found in very light wind, solid waves I found the slightly bigger fin offered more drive and grip. 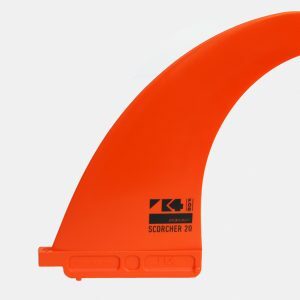 Before the Scorcher fin was released I would use a Stubby Center fin, This was usually used one Size larger than what I use with my Scorcher. “I use Quad with Scorchers, two big 14 and two small 8. 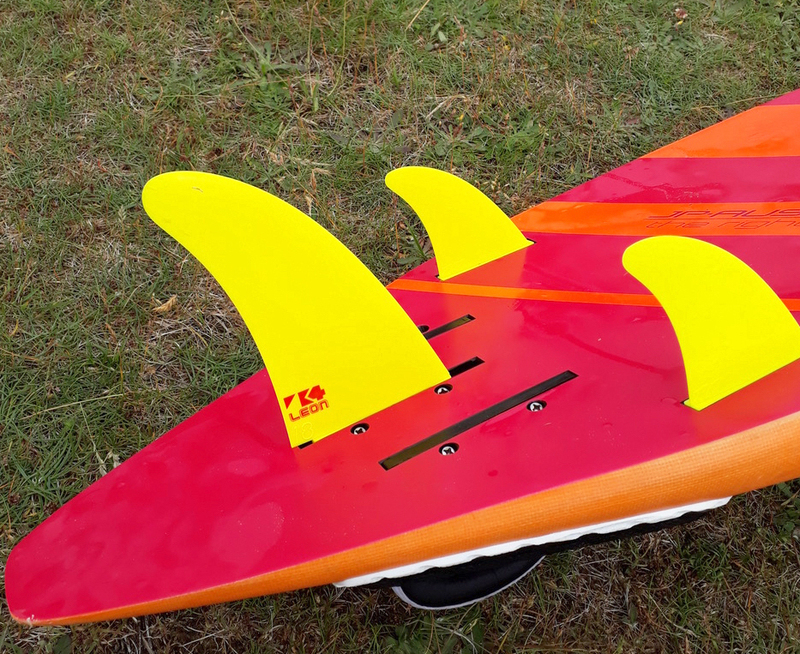 “My favorite set up is the Scorcher 15cm in the back and the shark2 9cm in the front. 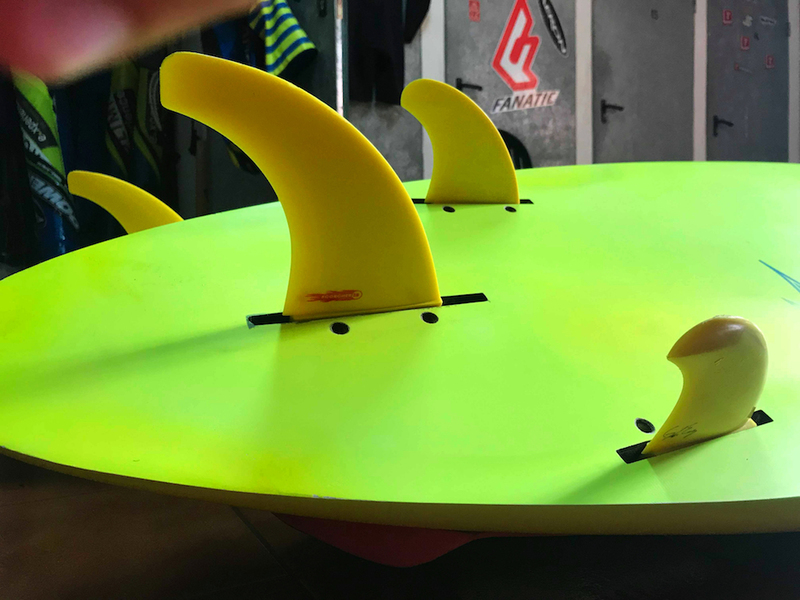 I like to use different sizes for the back fin, but it is always the scorcher: 14 cm when the wind is strong and the waves small, like Canary Islands in summer. 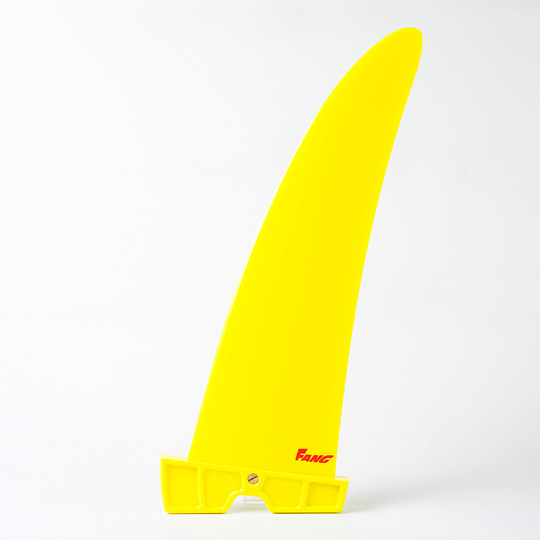 If the wind is up and down, and the waves not super small I will use the 15 cm, and this is the fin I use most of the time. 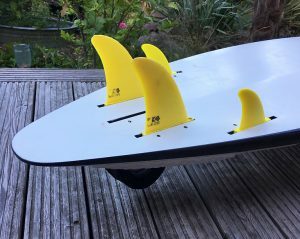 When the waves get big I go for the 16 cm to have a bit more drive and to handle the chop better. 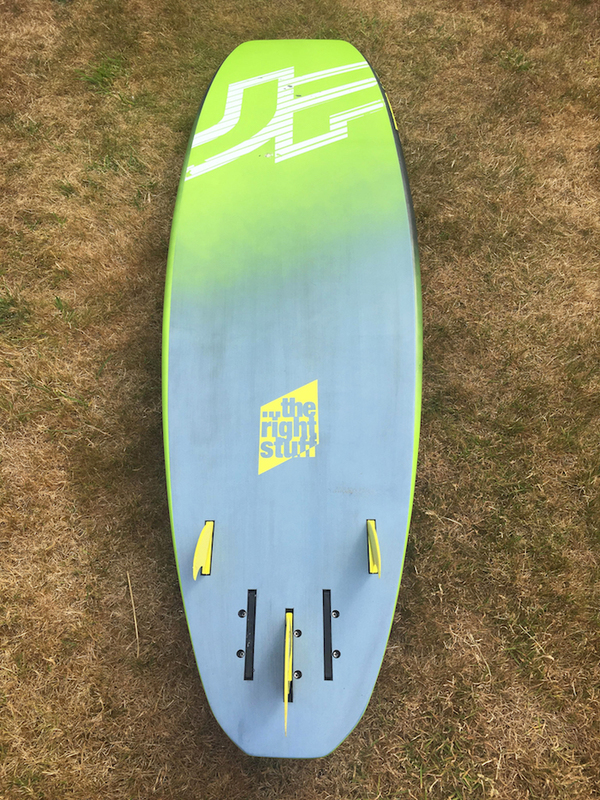 “Here I show you the pics on the only board I am using atm… I might get the other 2 boards at the end of this week! 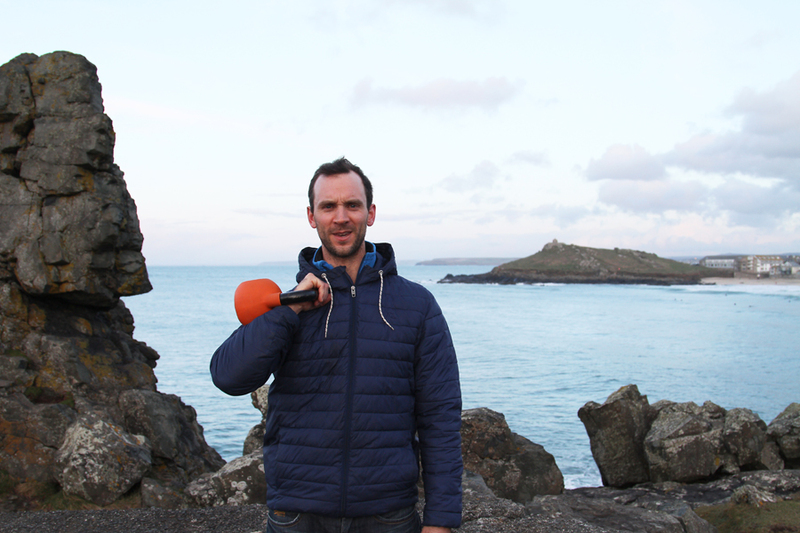 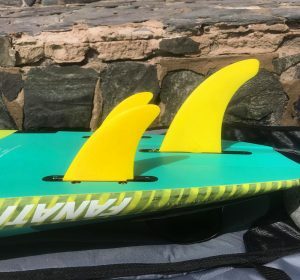 “For freestyle my go to fin is the 19cm ZBD, this gives me a good balance of hold and release for new school freestyle. 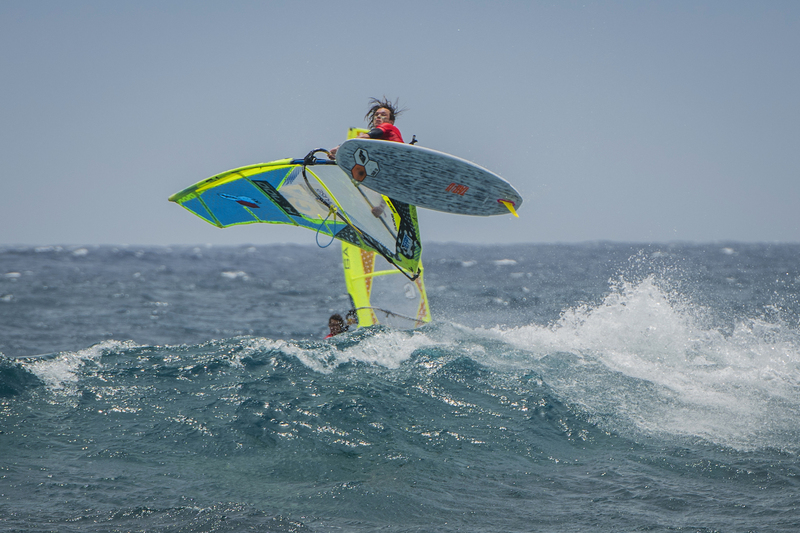 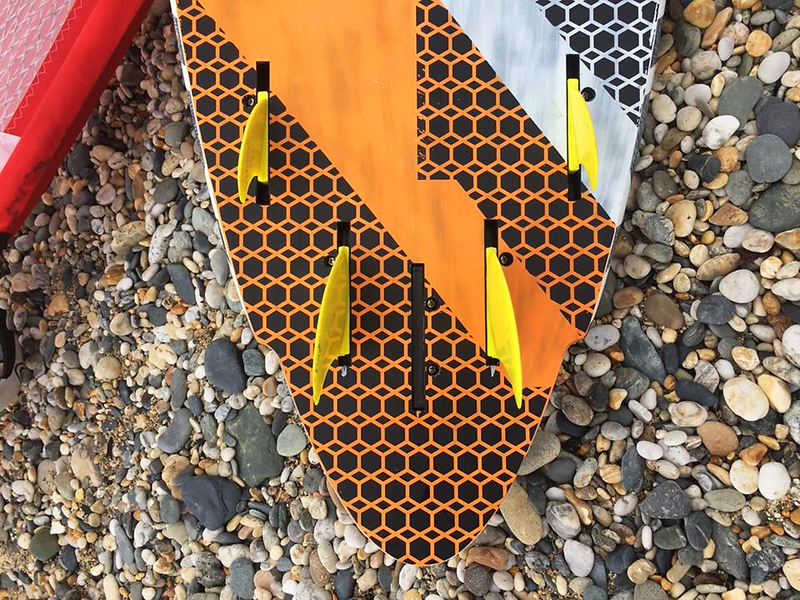 In the more choppy wavy conditions I have been riding the 20cm template for the extra control. 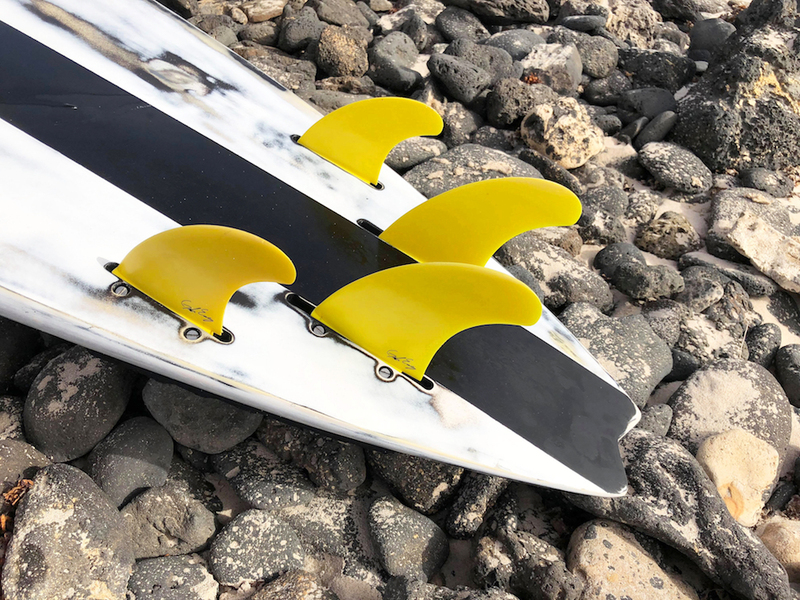 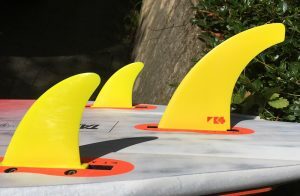 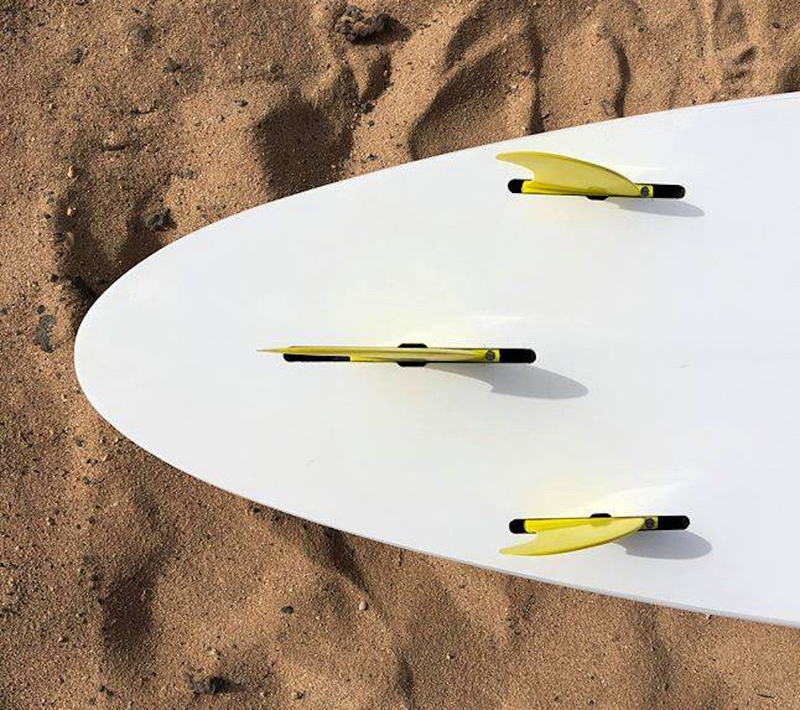 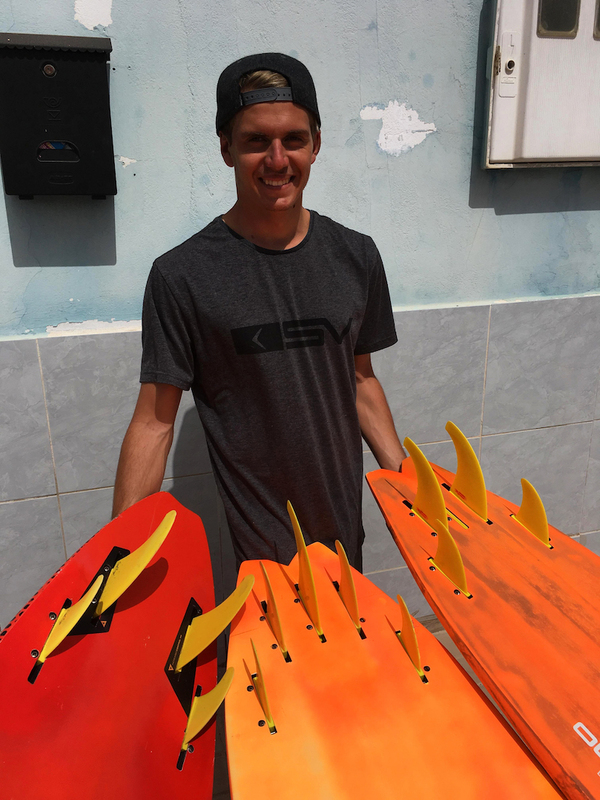 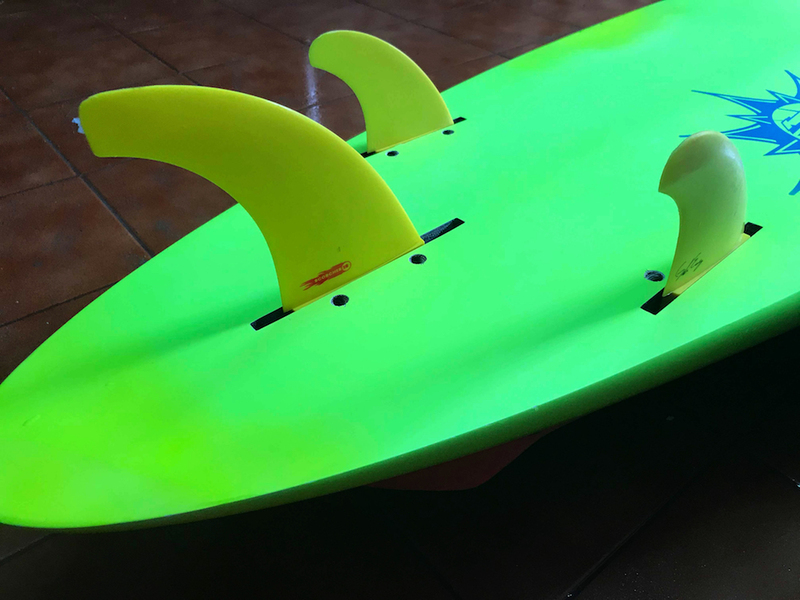 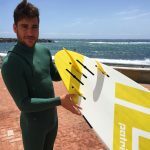 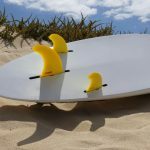 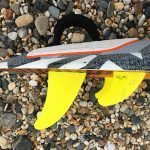 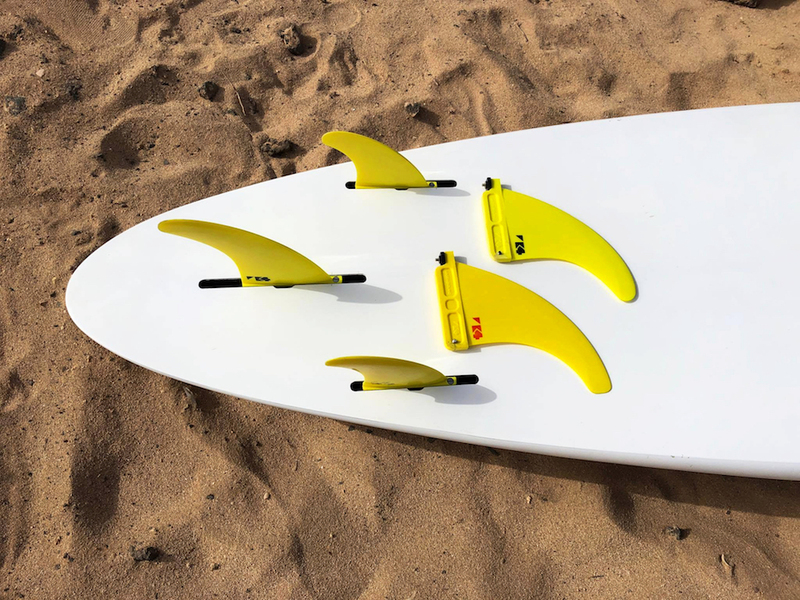 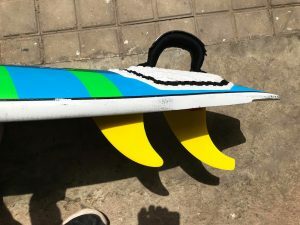 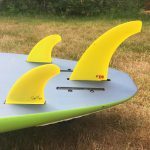 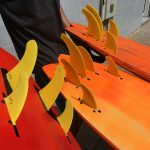 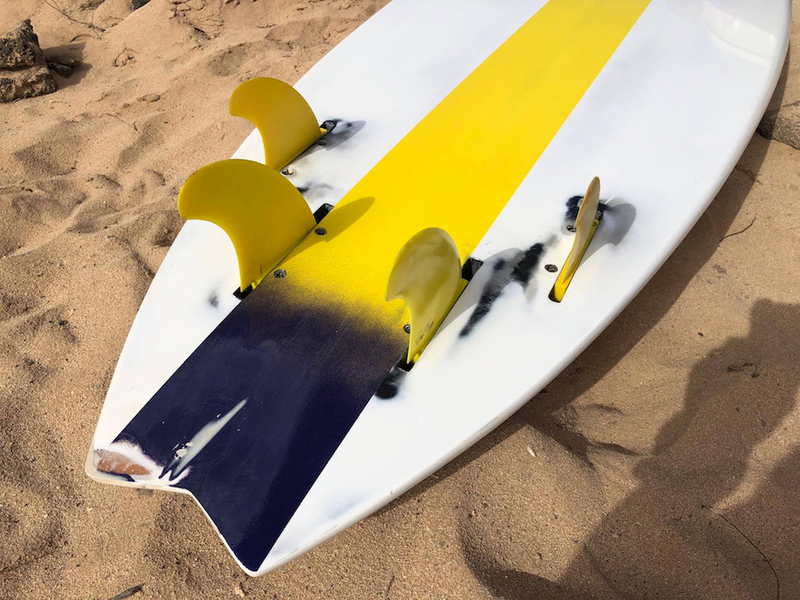 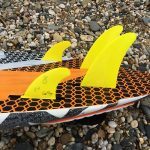 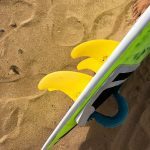 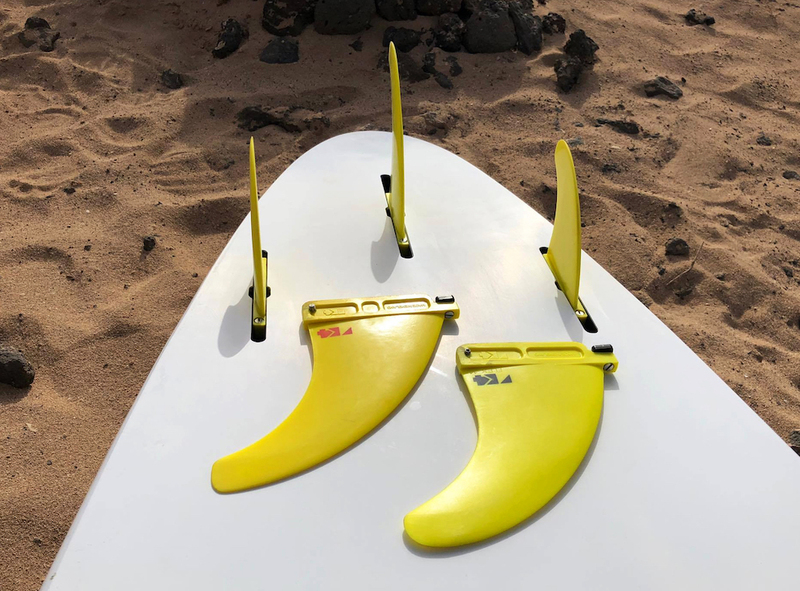 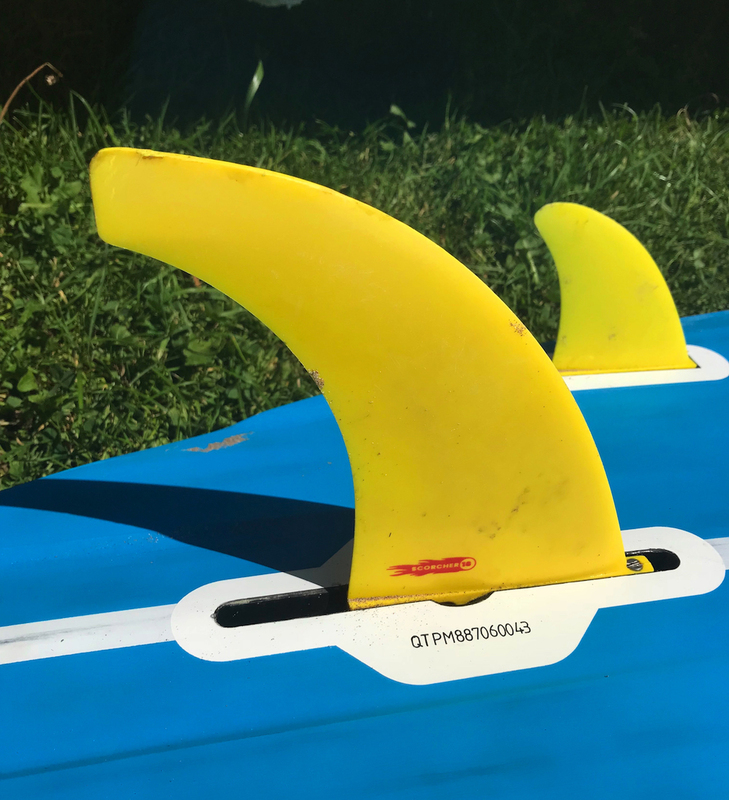 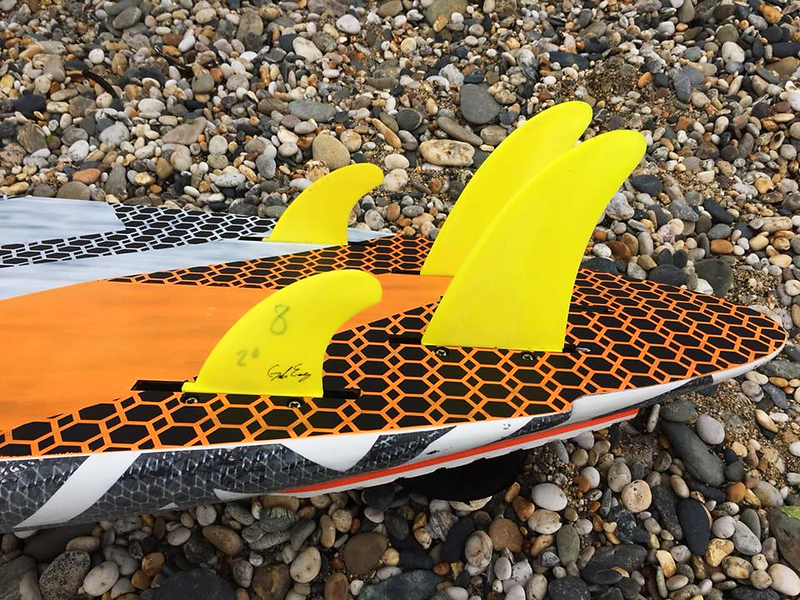 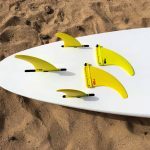 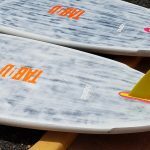 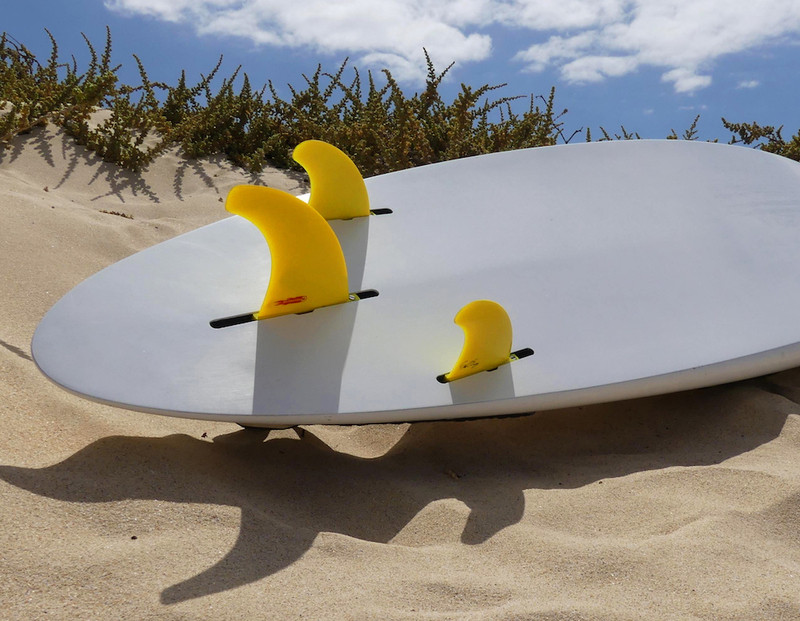 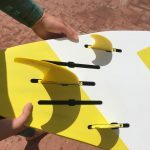 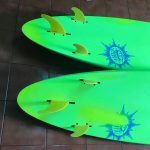 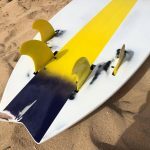 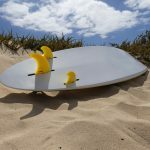 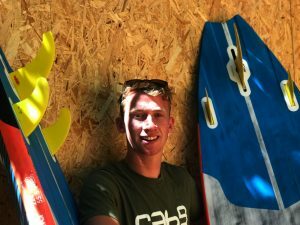 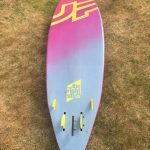 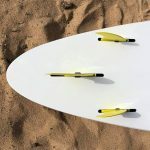 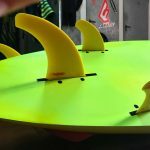 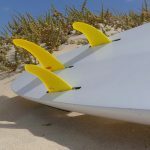 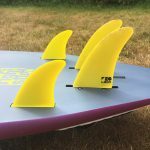 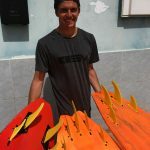 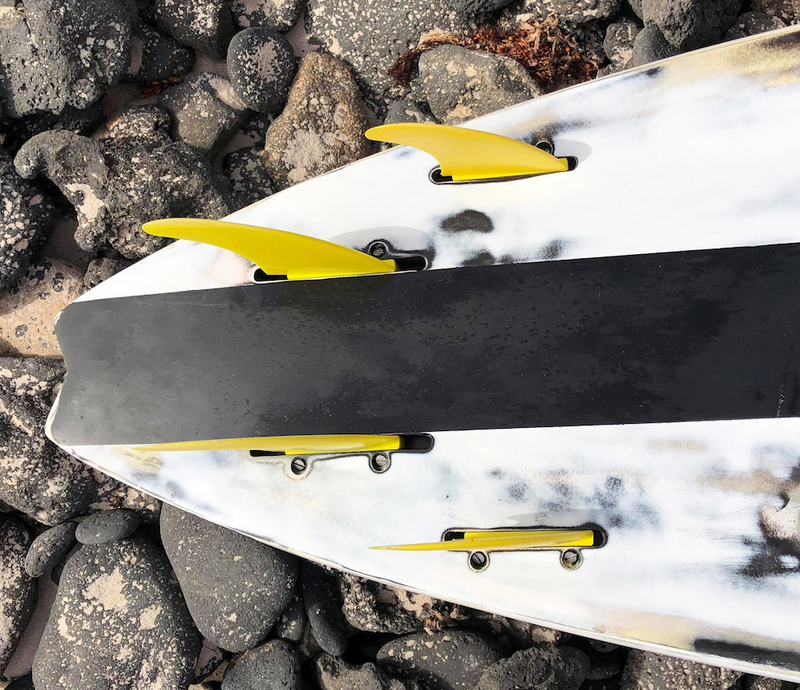 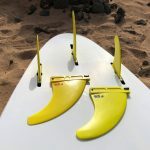 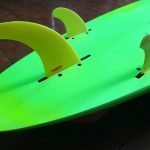 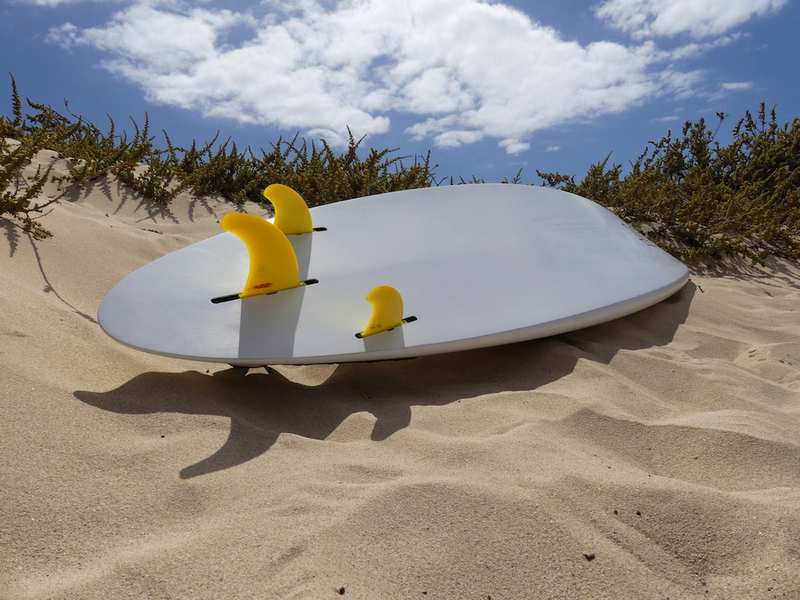 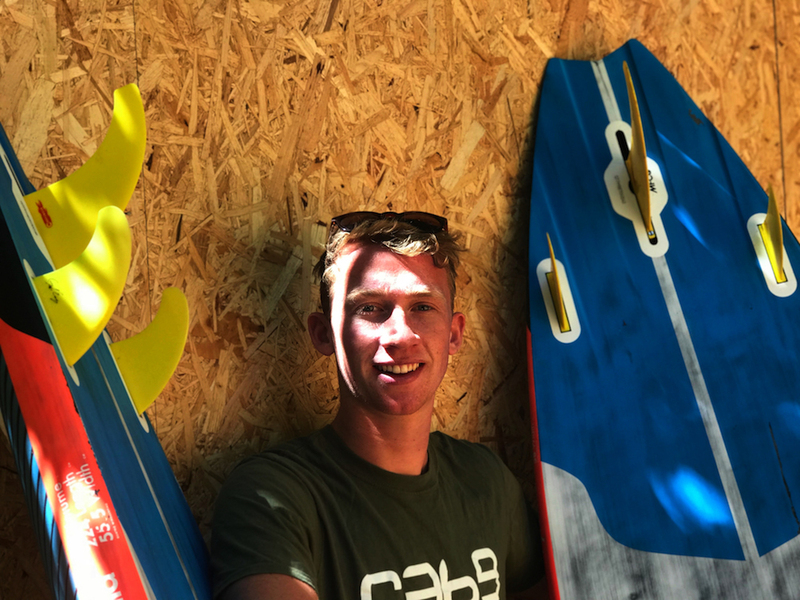 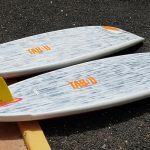 “I’m using Scorcher on the back 15cm and in front 10cm 1º ezzy fins in onshore conditions and side conditions, they are faster and have grip, good for me to make good botton turn and make the move. 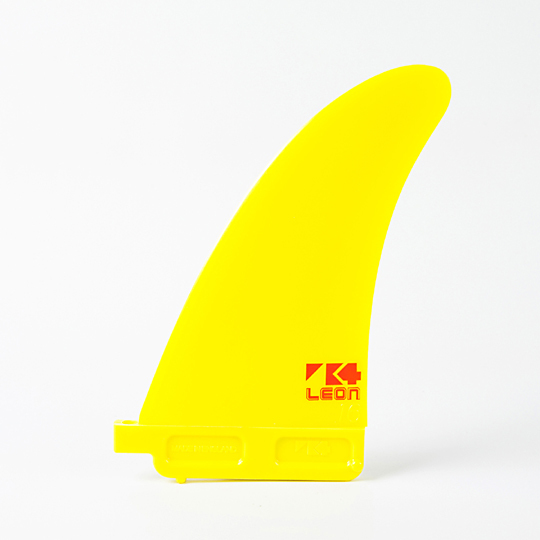 “The 73L Severne Nuevo I use 16cm Leon super stiff rears. 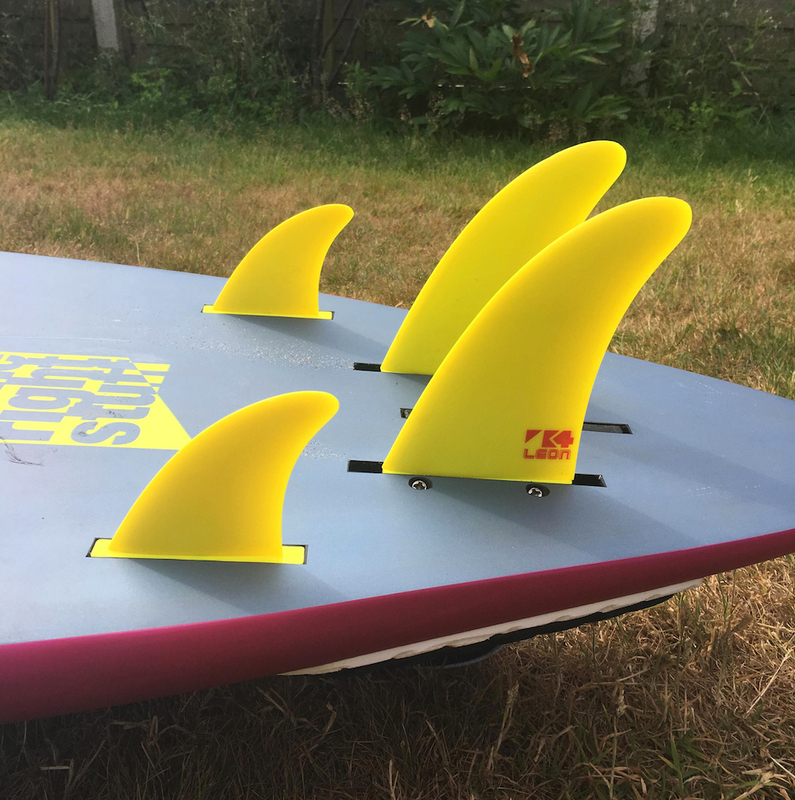 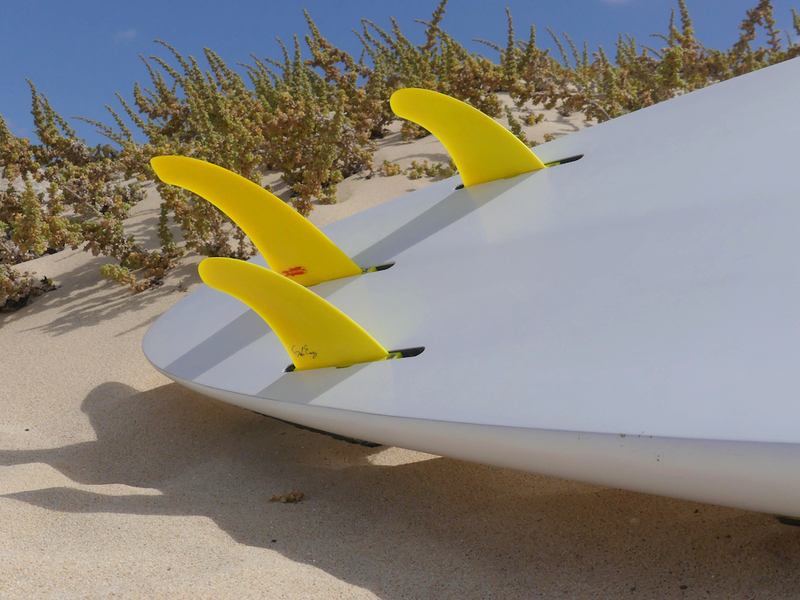 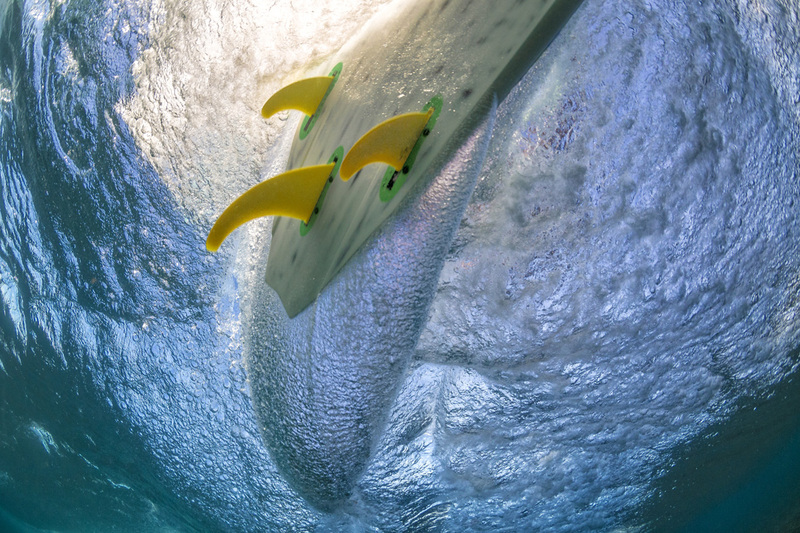 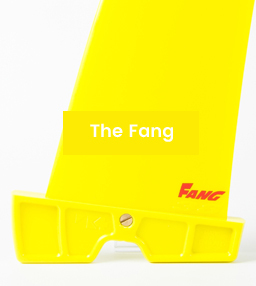 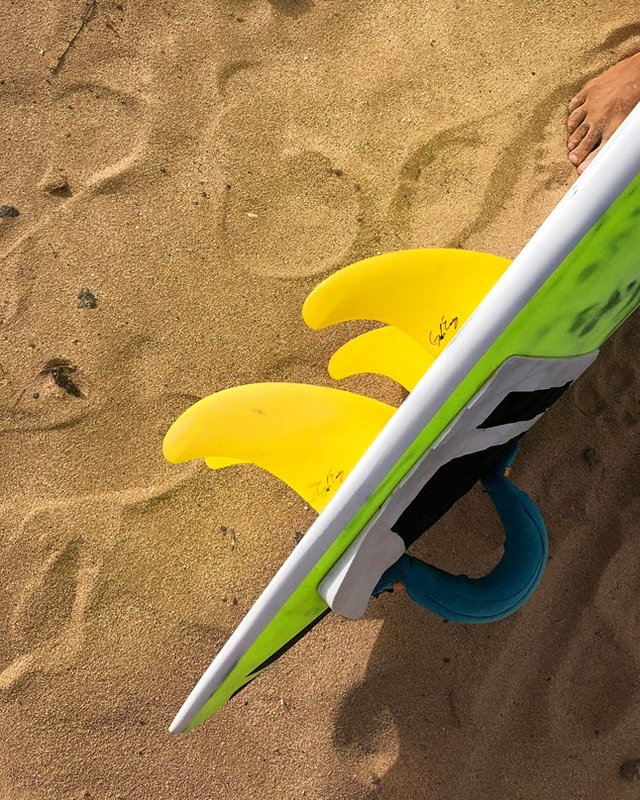 These fins provide a lot of grip and drive off the bottom for those late overpowered lip climbs. 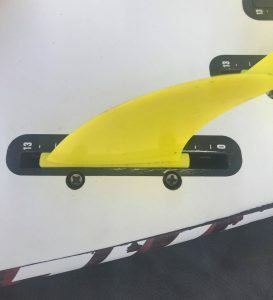 When you do blow your tail out you still don’t lose the board and spin out. 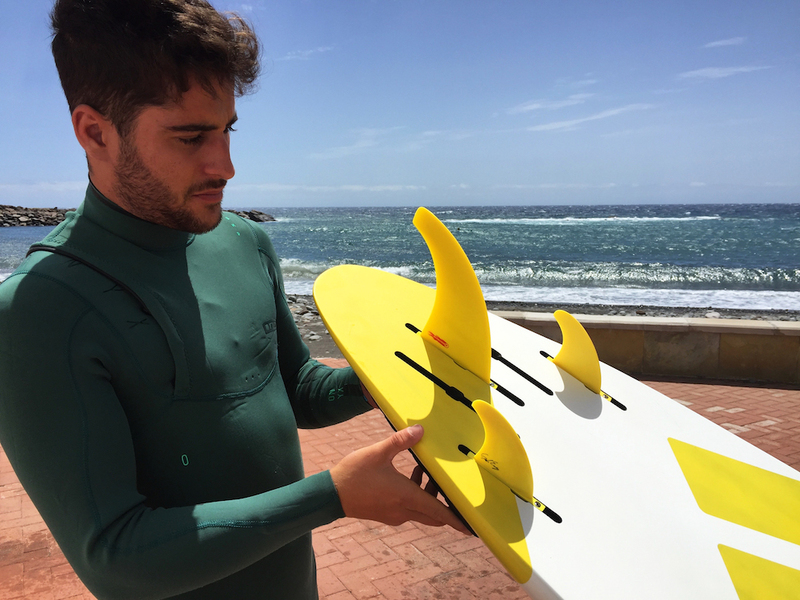 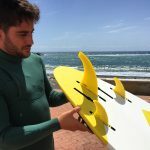 This is especially helpful in Cape Town and spots where waves are unpredictable. 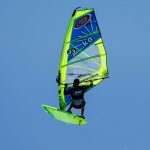 The super stiff Leon’s also gives you maximum speed for jumping. 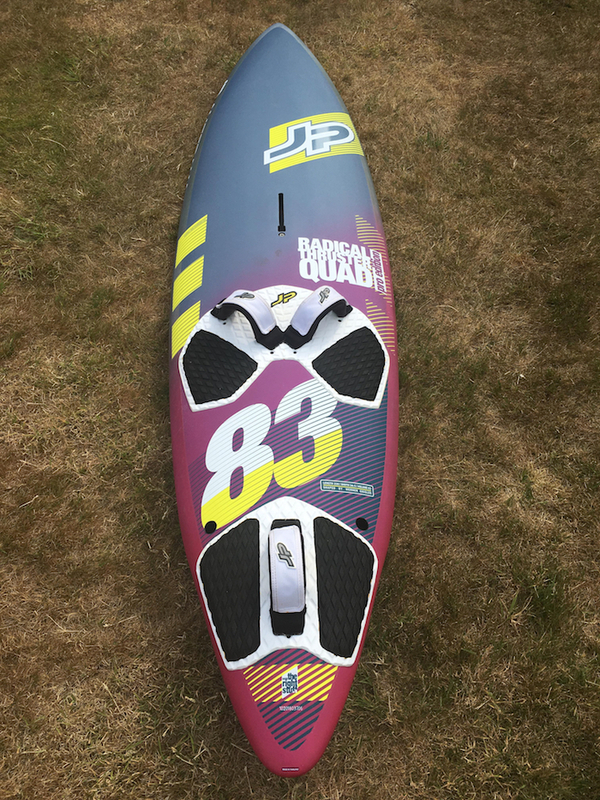 “In my Radical Quad 83 I’m using 15 Flexi Leon’s and 8cm SharkII’s. 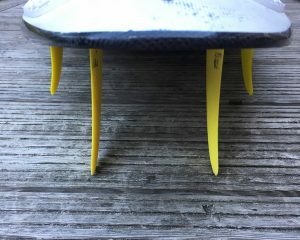 This is because it’s gotta be pretty windy to use my 83 so I prefer to have more grip hence the 15cm flexi Leon’s. 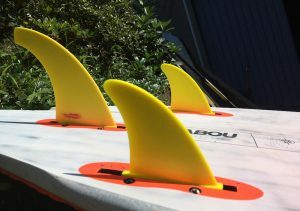 The SharkII’s feel nice and quick and whippy! In my Radical Quad 88 I’m using 15cm stiffy Leon’s so I can have a looser feel and throw the tail around a bit more. 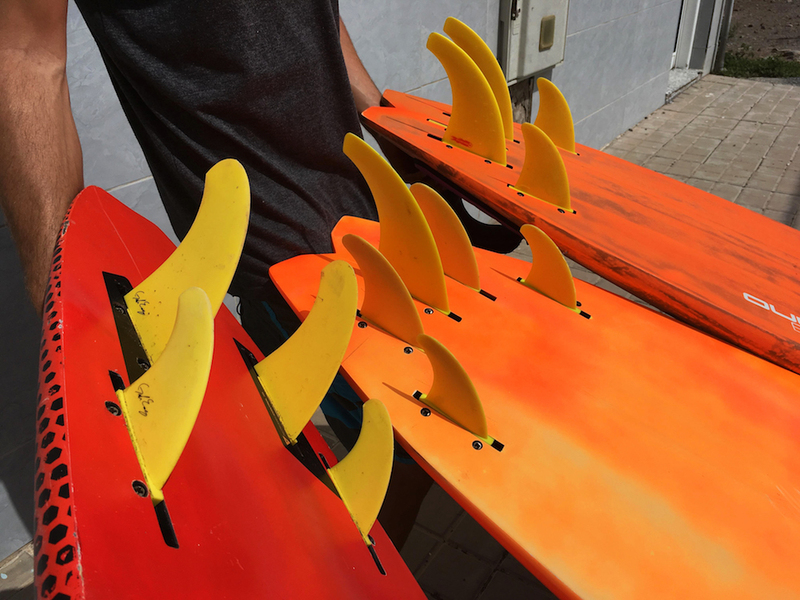 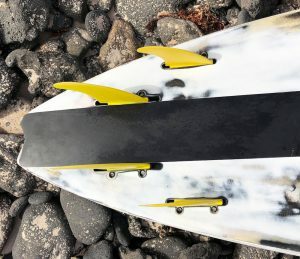 I use 10 Sharks for more lift so the board feels quicker on the wave in lighter winds. 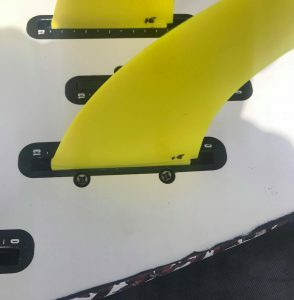 Graham is generally using 17/18 Scorcher rears for Pozo, with 10cm SharkII fronts (some standard and some proto 30/70 foil). 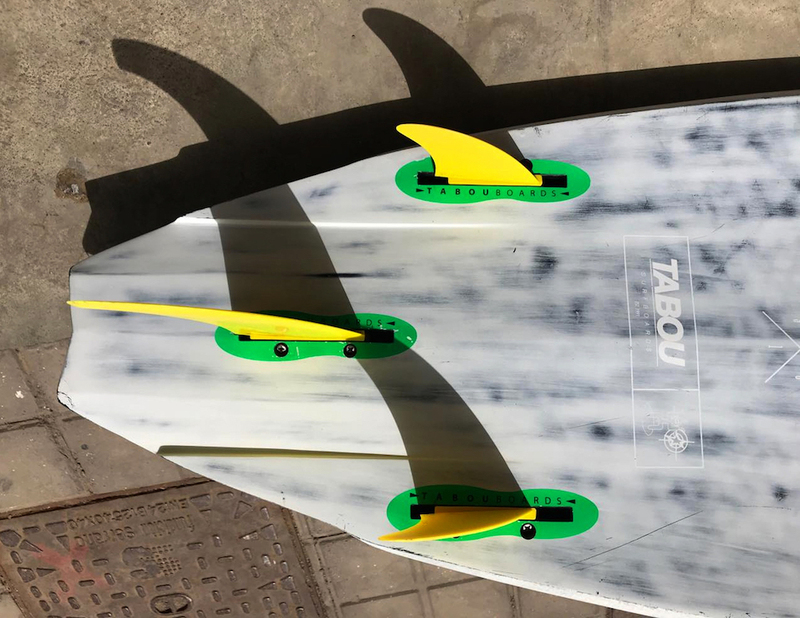 He’ll switch them out for Flex and Ezzy fins at more riding biased spots where the wave provides the drive. Quad – Ezzy 14cm 2º, Ezzy 8cm 3º. 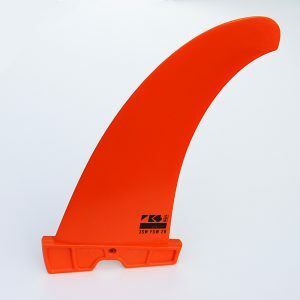 Pent – Scorcher 16cm, Stubby 10cm, Stubby 8cm. 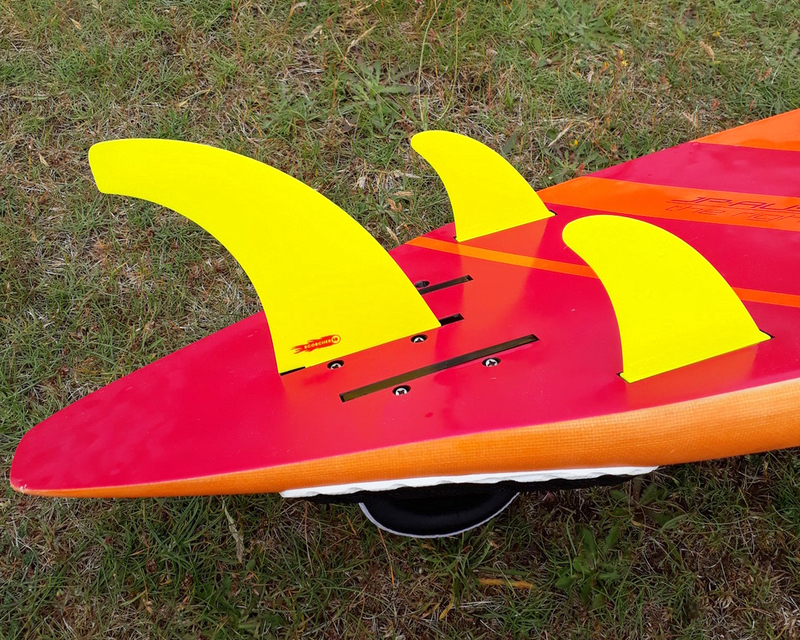 Quad – 14 Scorcher, 9 SharkII. 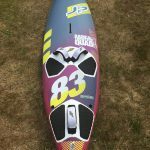 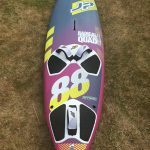 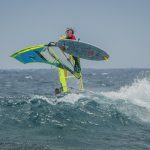 I’ve been sailing the production RRD Cult 82 this year. 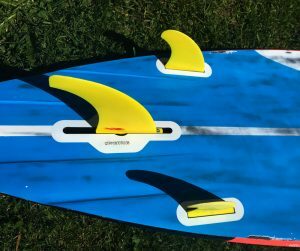 At first I sailed it as a tri as I’ve always favoured that set up in the past and it suits for testing 10cm fronts (Gernerally 18 Scorcher rear as the Flex feels a little soft in the rockered RRD). 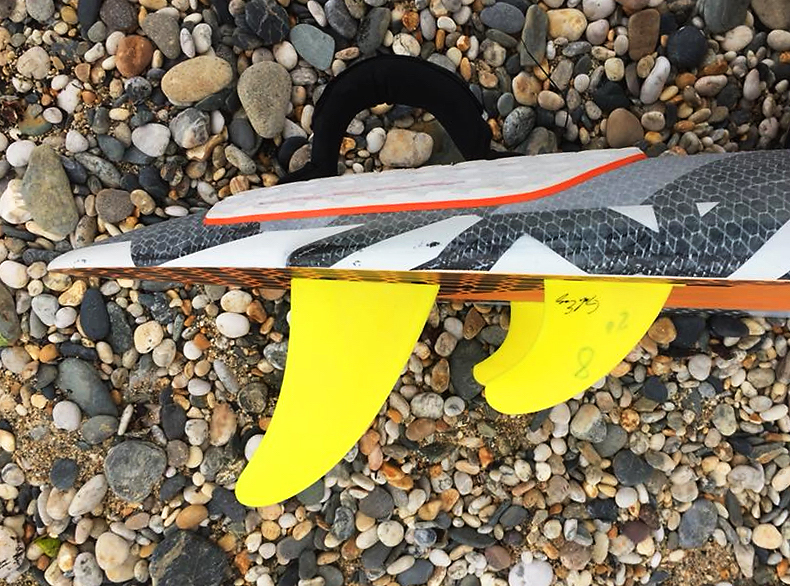 We had a windy X-onshore British competition earlier in the year and for that I thought I’d give a 16cm Scorcher twin set up a go, but found the nose drifted too much and it didn’t want to track upwind as well as it might have. 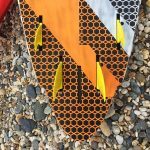 Wanting to get back out on the water quickly I decided to just chuck some Ezzy 8cm 2º fronts in and stumbled across bit of a magic set up – it worked super well despite being a lot of area. 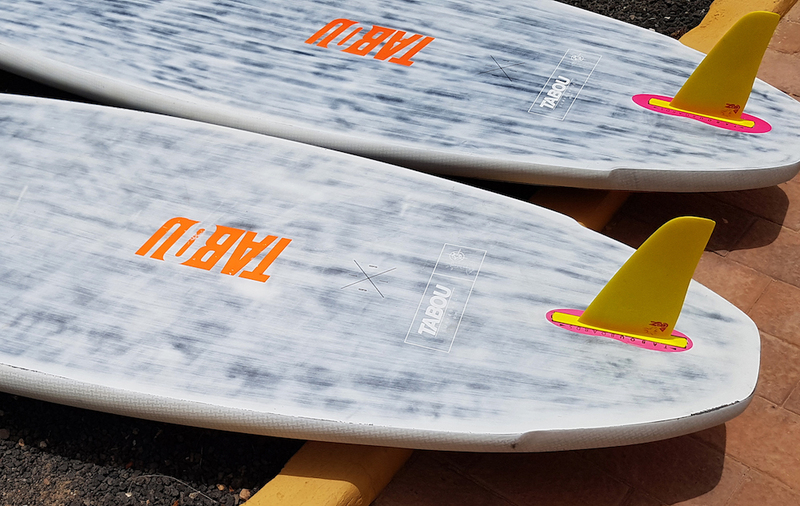 I’ve since dropped the rears down to 15 Leon ‘super stiff’ and that’s what I’ve been sticking with lately. 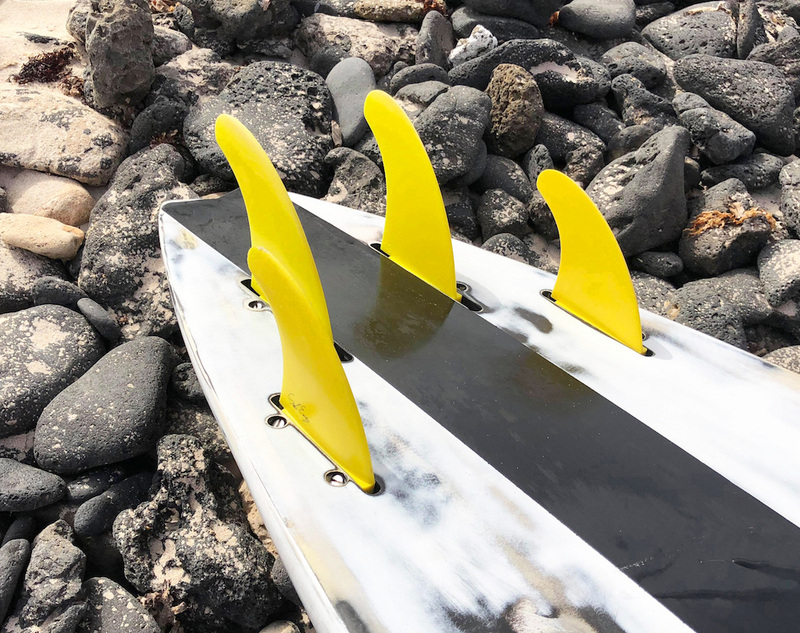 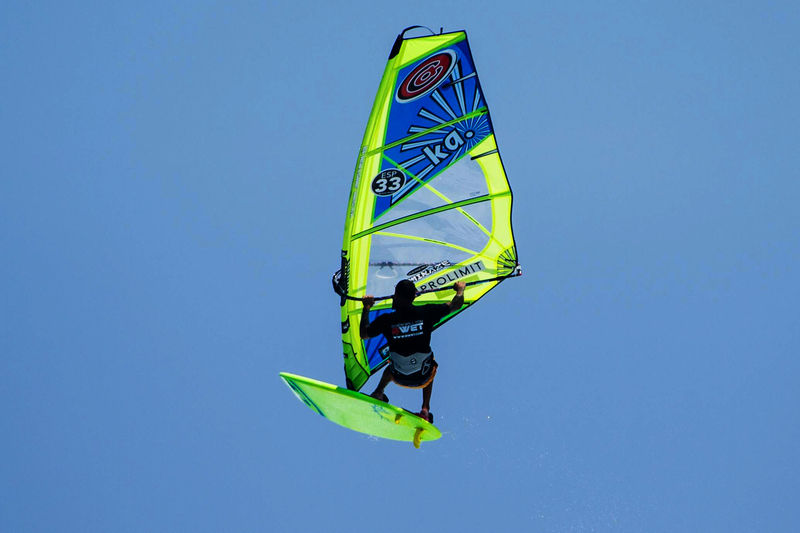 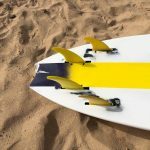 The Cult does seem to sail exceptionally well as a quad; the extra fin on the rail giving it a more precise and drivey feeling in the turns and more hold off the top (without affecting top speed). 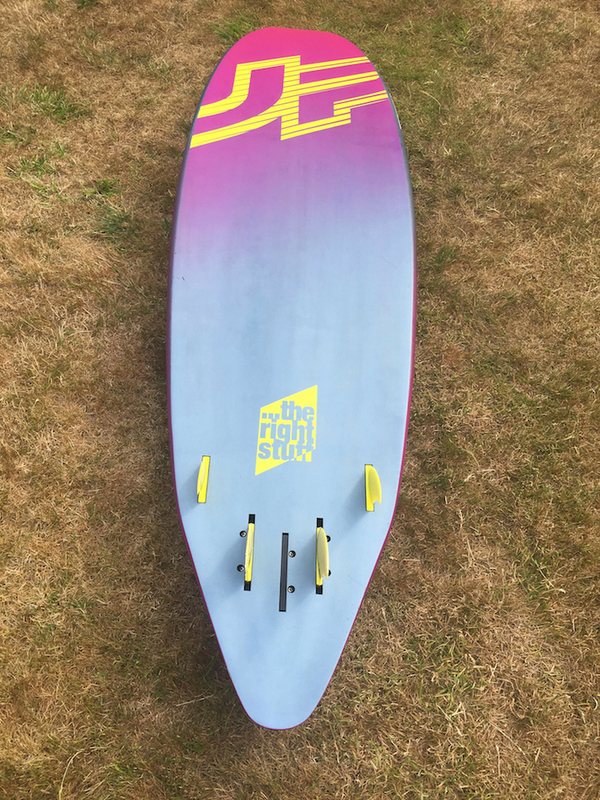 I do have a preference for ‘loose and grippy’ rides and the board has quite heavy ‘V’ throughout so this may be contributing to the quad performance. Perhaps the double rear fins help the water flow straight out the back of the board. 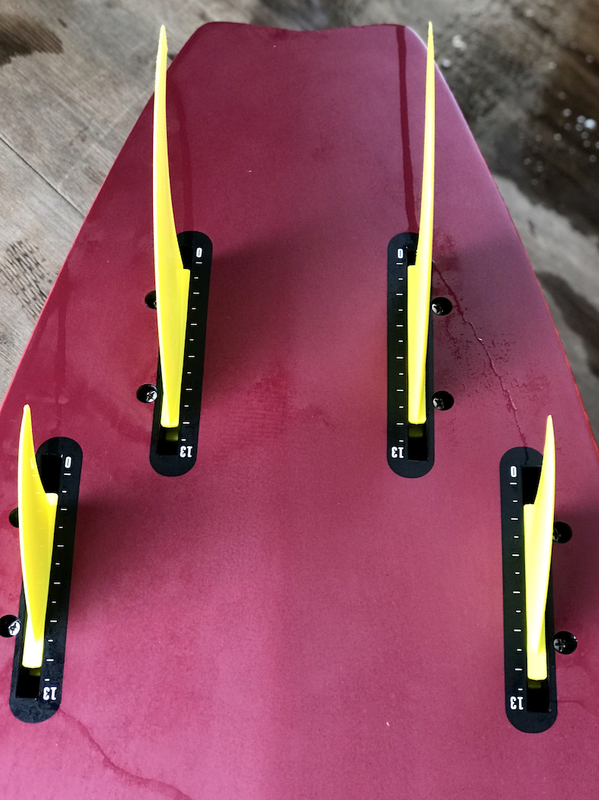 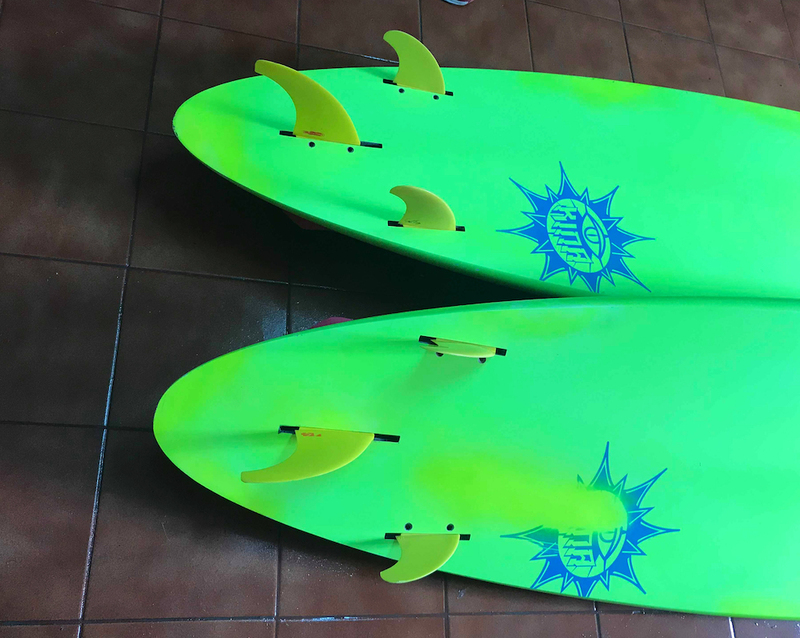 I’ve also taken John Skyes advice and placed the fins and rear strap at the back positions, which definitely seems to work best making the board fast, lively and easy to go 12 ‘o’ clock.